The Lockheed Vega was a record breaking airplane that beat several speed and distance records. It was built in several versions with various seating accommodations and engines. It was a cantilever monoplane transport that carried four to six passengers. It was designed by John Northrop and Gerard Vultee in 1927—both would later own their own companies. The first Vega 1, named the Golden Eagle, was a four seat transport with a maximum speed of 135 mph (217 km/h) and cruising speed of 120 mph (193 km/h), which was considered fast at the time. It was too small for commercial use and private owners placed orders and a total 68 of this model were produced. In 1928, it won every award at the National Air Races in Cleveland, Ohio. The Vega 5, Yankee Doodle, was used to break coast-to-coast records and set a record on August 19-20, 1928 by flying from Los Angeles to New York in 18 hours and 58 minutes. This was also the first non-stop coast-to-coast flight from west to east. The Vega 5 was modified to be powered with a 450 hp (336 kW) Pratt & Whitney R-1340 engine and an NACA cowling which increased the top speed to 165 mph (266 km/h) and the cruising speed to 155 mph (249 km/h). Two additional seats were installed. The USAAC bought aircraft two and were designated as the C-12 and C-17. It made a number of notable flights by Amelia Earhart and Wiley Post. In 1932, Amelia Earhart flew a bright red Vega 5B alone across the Atlantic Ocean and then flew non-stop across the United States which were both firsts for a women. 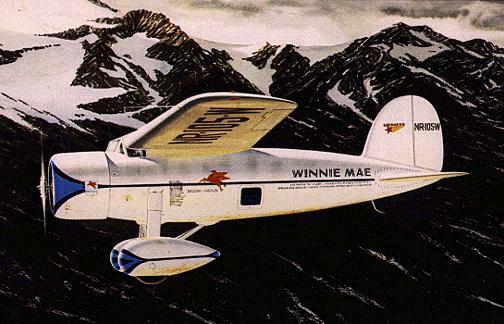 On June 23, 1931, Wiley Post and his navigator Harold Gatty left New York for a flight around the world in the Winnie Mae. They completed the flight in a record 8 days, 15 hours and 51 minutes. In 1933, Wiley Post completed a solo around the world flight in a Lockheed Vega in7 days, 18 hours and 49 minutes. In 1934, he pioneered the use of high-altitude suits and was able to fly as high as 50,000 feet and discovered the jet-stream. One 500 hp (373 kW) Pratt & Whitney R-1340 Wasp 9-cylinder radial engine. 1. Rene J. Francillon, Lockheed Aircraft since 1913. Annapolis, Maryland: Naval Institute Press, 1987. 67. Created September 15, 1997. Updated September 4, 2014.